This release by Megadeth was their fourth studio album and marked the debut for two new members in the band. Drummer Nick Menza and guitar wiz Marty Friedman were the newest editions to the band and the result was a stunning piece of heavy metal mastery that still to this day, stands as a landmark album and certainly one of the best (if not the best) Megadeth album ever made. I really wasn't a huge fan of this band, I liked some of their songs, such as Wake Up Dead and Peace Sells from the Peace Sells...But Who's Buying? album and I liked a couple from So Far, So Good...So What? namely In My Darkest Hour. To me, some of their material was a bit disjointed and a little chaotic as far as song structure and suffered from poor production. I never owned a Megadeth album until this one came out. Being a big fan of Marty Friedman and his Cacophony (Speed Metal Symphony) project with Jason Becker, I figured if he was now in Megadeth, then the music they were doing must be of the calibre to warrant his involvement with the band. I bought this CD without hearing a single note of it for that very reason. I'll never forget the first listen to this album, I couldn't believe how great an album it was. Sure it had all the sneering and cynical Dave Mustaine vocals and lyrics which were so typical of all the other Megadeth albums, but musically, the band was maturing and writing very catchy, very heavy and very well structured heavy metal music. Employing the services of veteran producer Max Norman (Ozzy - Diary Of A Madman and Bark At The Moon albums), gave this album a more "complete" and solid sound than they'd ever had before. The album opens with some killer chunky and fast riffs for the first track, Holy Wars....The Punishment Due. Classic Megadeth riffing and some typical Dave Mustaine scowls examine the power and the role of religion in our society and the senseless killings that have been made in the name of God. A great fast tempo change rips into some wildly fast riffing and soloing through to the end. Hangar 18 explores the legend of the whole Area 51 phenomenon whereby, legend has it that the U.S. Air Force recovered a crashed U.F.O. in the 1950's and alegedly have it stored along with the bodies of dead aliens. The track starts pretty much as a straight ahead song with some great riffing and some cool guitar harmonies. There's some great leads and instrumental breaks especially the pounding heavy riff which jumps in near the end to accompany the lead solos. Take No Prisoners has a classic thrash style guitar intro and has an overall sense of recklessness to it. A fast and heavy song that again, contains some great and very technical riffing. The world of magic and sorcery is explored in the song Five Magics, in which the first two minutes of the song features some cool thematic guitar passages, some great riffing and solid bass work by Dave Ellefson. The song really kicks into a fast and aggressive tempo and gets the full Megadeth treatment. Several abrupt and very fast tempo changes are also highlights on this track. Poison Was The Cure is a quick 3 minute almost punk-like song that almost reminds me in spots of Purgatory by Iron Maiden (Killers album). Looking back, I think Dave Mustaine was trying to reach out with this track and if you look behind the meaning of the lyrics, he was writing about his problems with substance abuse that eventually almost killed him in the mid 1990's. Lucretia, a tale of a witch, again uses some very clever and technical riffing and is another very solid track. One of my personal favorites, Tornado Of Souls, aside from amazing riffing, is a more structured song than some of the others and actually has a great catchy chorus, something seldom heard on Megadeth songs. The lead guitar playing on this track is another highlight. Dawn Patrol is a simple narrative song with just percussion, bass and voice and sees Dave Mustaine trying his best to do an English accent.....!!!. 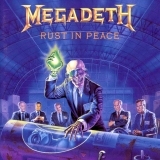 This track leads into the title track, Rust In Peace. The sinister, speedy and sometimes reckless guitar riffs especially during the verses, serve to accent the theme of the song, the evils of the arms race and the nuclear threat that existed all through the 80's and into the 90's. I don't think this band has ever sounded as exciting and as tight as they were on this release. There are still some very abrupt and chaotic instrumental changes, but the arrangements for the songs were simply brilliant and everything just seemed to come together on this album. I listened to this thing constantly for weeks when I first got it and truthfully, I hadn't listened to it in a few years before dusting it off for a listen to refresh my memory of just how great this album is, for my review. You know, I still get the same excitement listening to this as I did 12 years ago......a truly stunning piece of work and worthy of being called a heavy metal classic if ever there was one.